COMMUNITY NEWS & REVIEWS: MRS. PAM DANDO - It is with great sadness that I have to pass on the news of the recent death of Mrs. Pam Dando. Although not a resident of Ewhurst Parish, Pam actually lived in Bodiam for a great number of years so was very well known there also. Pam was a long time member of our local W.I. - she served on the committee for several years and when ill health prevented her from continuing this role in the manner she wanted, Pam still supported the W.I. by joining in with the many activities, outings, and events that were organised throughout this time. She enjoyed the social side of the W.I. and was always ready to be of help - whether it was to bake a cake, be a driver - until her health forced her to give up her car - and was a kind and helpful friend to all. Pam had a ready smile and a cheerful disposition to everyone, and needless to say, she will be sadly missed. Her funeral, at St. Giles church, Bodiam, has already taken place. BATTLE & RYE POLICE STATION: REVISED OPENING TIMES A Public Information Notice (PIN) has been received in relation to the opening times of BOTH BATTLE & RYE Police Stations. The Public Front Offices at BOTH- BATTLE Police Station and RYE Police Station are to change their operating times. These changes will take place from MONDAY AUGUST 6th.2018. BATTLE Police Station’s new opening times will be from 9.00am until 12.Noon. RYE Police Station new opening times will be from 1.00pm until 4.00pm. BOTH Police stations will still be open from Monday to Friday. You can still report any crime or suspicious activity either by telephone by dialling 999 - if urgent help or assistance is needed - or by dialling 101 - if not considered urgent. You can also still report crime or incidents on-line at www.sussex.police.uk/reportonline The Sussex Police are also always wanting to know your views - see what?s new and give them your feedback together with ‘helpful’ suggestions at www.sussex.police.uk Please remember, - they are on your side - and are always there to help and protect you to the best of their ability. ROTHER RAMBLERS: Continuing to make the most of this glorious weather are the members of that popular walking group - the Rother Ramblers. 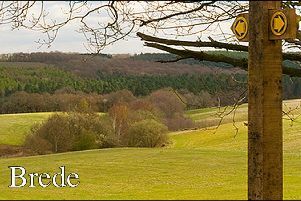 Three - yes 3 walks have been planned for our enjoyment this week, beginning with - Walk No: 1 which is arranged for Saturday July 28th and is a 9 mile circular stroll of Catsfield to Crowhurst. The meeting place will be outside the Ninfield School, in Church Lane, Ninfield. OS.EXP124. TQ705122. (satnav TN33 9JW) at 10.00am. As usual, a picnic lunch has been suggested. Alison & Perry are to be your ‘walk leaders’ for this outing and you may contact them on their Mobile No:07979~025507 for the CORRECT MEETING POINT details. Walk No: 2 is planned for Wednesday August 1st and will be another 9 mile circular walk but this time from Alfriston. The meeting point for this walk will be Alfriston Primary School, North Road, Alfriston. OS.EXP123. TQ518034. (satnav BN26 5XB) at the normal meeting time of 10.00am. The ‘walk notes state “ Moderately strenuous clockwise route from Alfriston, down the Cuckmere River to Litlington. Then climbing and heading in a N.W. direction towards the Rathfinny Estate and visiting the villages of Alciston and Berwick. Good clear paths with far reaching views across the South Downs. Dogs are welcome, but must sometimes be kept on a lead. Again a picnic lunch is suggested”. Wil has the task of being your ‘walk leader’ for this excursion and you may contact him on - 01797~260417 or Mobile No:07801~189747 for all further information. Walk No: 3 is organised for Thursday August 2nd and is a lovely EVENING WALK of just 5.5 circular miles of Ninfield to Catsfield The meeting place is Ninfield Church. OS.EXP124. TQ705122. (satnav TN33 9JW) at 6.00pm. Parking will be roadside, near the Primary school. Drinks & crisps are the order of the day, at the White Hart Pub. Rita & Lionel are to be your ‘walk leaders’ for this lovely evening stroll and you may contact them on 01424~752452 for the CORRECT MEETING POINT information. WINE TASTERS @ EWHURST: If like many of us within the parish, you enjoy a delectable glass of wine now & again, then why not consider joining in the monthly Wine Tasting at Ewhurst. This is a super little social group of like-minded people who enjoy a couple of hours per month tasting and commentating on a selection of wines - plus bread and a few nibbles -all wrapped up in good company in a cosy venue, that being the Herdman Pavilion in Ewhurst Green, (TN32 5TB) The July Wine Evening gathering will be held on Friday July 27th.- THAT’s TONIGHT - from 7.30pm to 9.30pm.-- No membership is involved, just a matter of advising the host if you are attending - this ensures there is sufficient wine for everyone to enjoy! £5:00 per person is all that is required upon arrival. If you think this is of interest to you, please contact Janis via her email - janhooper3@hotmail.co.uk to learn more about this friendly and welcoming group. We are very friendly group of people and will certainly make sure you have a very warm welcome upon arrival and a glass of superb wine in your hand, very shortly after !. DATES FOR YOUR DIARIES: Advance Notification of four (4) very interesting - but all very different events that will be happening in - (or rather close-by to) - our community very soon. DIARY DATE No: 1. The Ewhurst, Staplecross & Bodiam Garden Society invite you to join them in a special early evening stroll instead of the normal monthly meeting in Staplecross Village Hall. On Thursday August 16th. at 5.00pm. Although we won’t be having a meeting in Staplecross next month we do have an opportunity to visit beautiful Alexandra Park in Hastings for a guided walk with Owen Johnson, Britain’s leading authority on rare trees.The walk will take approximately 1.5 hours and we will be shown the collection which includes both ‘Specimen’ and ‘Champion’ trees. In case you aren’t familiar with the term, ‘Champion trees’ are the largest trees of their species growing within the British Isles. They can qualify for the title ‘Champion’ either by being the tallest or by their trunk having the largest girth which is measured at 1.5 metres off the ground. This delightful and interesting walk is open to members and guests, the more the merrier, and the cost is by donation and we ( the Garden Society) suggest £2.50 per person. We recommend people wear sensible shoes so put those high heels - away, at least for the walk !.There is ample parking in the road in the Harmers Lay-by and we are to assemble at the café in Alexandra Park by 4:45pm to allow us to meet up with Owen in good time to start the walk at 5pm. - These details will be confirmed nearer the time. For more details of this event, please contact either Gil on 01580~83055 - Maggie on 01580~830041 or Peter on 01580~830316. It promises to be a stroll of delight and discovery. DIARY DATE No: 3 - The E.S. & B. GARDEN SOCIETY : Back to our local Horticultural Society, - but just to inform you of the last of their shows for 2018. The Flower, Fruit & Vegetable Show will take place on Saturday September 1st. at 2.30pm - BUT STAGING YOUR ENTRIES ARE BETWEEN 9 AM AND 11,00AM and will be held again at the Village Hall, Northiam Road, Staplecross TN32 5QG. This is a delightful show with something for everyone and a class or 2 to consider entering. With over 50 Classes to choose from, you’ll be spoilt for choice as it’s not just for the “green-fingered” folk amongst us !. Schedules are already at the Londis Store in Staplecross village, - and if they have run out, please contact the two Show Secretaries which are Pam on 01580~881839 or Maggie on 01580~839941 for more information Friendly help & guidance is always unstintingly given, so why not give it a go ? DIARY DATE No: 4 - It’s that time of the year again, when the whole community come together to enjoy and support this “Coffee Morning - with a Difference” event. Up and down the country - and even across the world - people are getting together to enjoy a cuppa, a slice of cake and enjoy congenial company whilst helping to raise such necessary funds for this amazing good cause. The date to remember is Saturday September 29th. at Staplecross Village Hall between 10.00am and 12,Noon. There will also be a raffle stall and a Tombola for the lucky ones to try and perhaps other stalls to peruse. This may seem rather a long way off, but it’s such a super little event, and again for such a worthwhile cause that this is definitely NOT a date to miss ! Please contact Pauline on 01580~830570 for all further details. CHURCH SERVICES: CHURCH SERVICES for the parish of Ewhurst, will commence at St. James the Great, Ewhurst Green on Sunday July 29th.Trinity 9 at 9.30am. This service will include Holy Communion. (CW) There will be NO SERVICES at BOTH St. Giles church, Bodiam AND at St. Mark’s church, Northiam Road, Staplecross, today. If there is any church matter on which you feel you may need further assistance, especially Baptisms, Weddings and sadly, Funerals, then do please get in touch with the Priest - in - Charge, which is of course our good friend - Canon Christopher Irvine on 01580~830925. Help, love and support in some way, is always at hand and always so generously given, so do please contact him. ANY NEWS FOR THIS COLUMN: PLEASE CONTACT ME: The weather at present is continuing to be contradictory, with the glorious sunshine and warm long evenings, this is English summer time at it’s best but it won’t be long before we are complaining about the drought and having to water our gardens (!) - it can only be the English who are obsessed with the weather - especially when other areas close to us are suffering (!) from torrential down pours and in some cases, severe flooding or equally devastating, grass or forest fires, brought on by the excessively long dry period. Life in and around our villages and community is far from being dull as lots of events are being planned for our enjoyment. So if you are arranging an event in the foreseeable future, --- whatever the nature of the event and however large or small, indoor or out, and you’d like some extra free coverage for it, -courtesy of the Observer Newspaper - then please get in touch. If it’s of interest to you, - it’s of interest to us. It’s never too early to send in any of the details and to tell us what you are arranging. So please do contact me, as I’d love to hear from you and to help ‘spread the word’ on your behalf. ..........Thank You.